Neptune rotates once on its axis in about 16 hours. 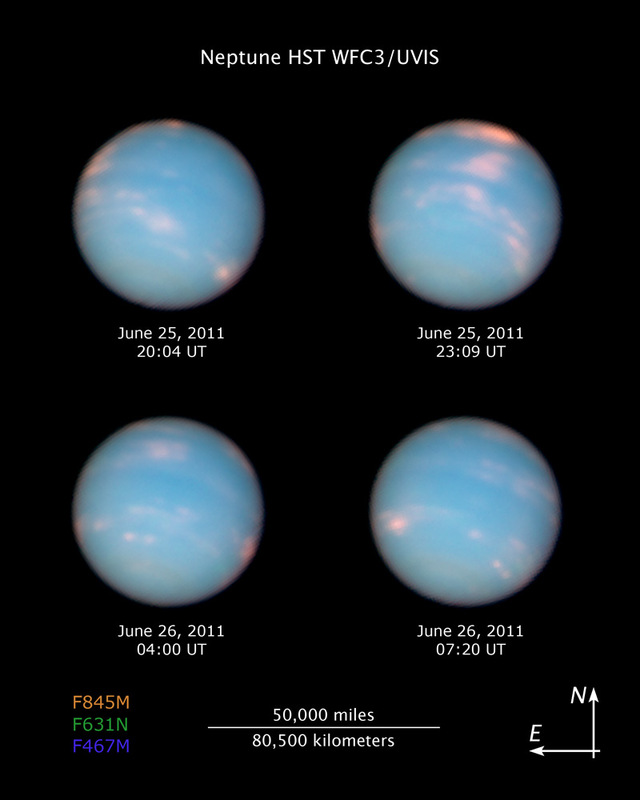 So, spaced about 4 hours apart these 4 images of the solar system's most distant gas giant cover one Neptune day. Recorded by the Hubble Space Telescope in late June they combine exposures made with visible and near-infrared filters to show high-altitude clouds composed of methane ice crystals against the planet's normally blue cloud tops. Because Neptune's axis of rotation is tilted to its orbital plane by 29 degrees, compared to Earth's 23.5 degrees, Neptune experiences seasons analogous to Earth's. As early summer comes to Neptune's southern hemisphere and winter to the north, Hubble observations have shown cloud activity shifting to the northern hemisphere. In fact the progression of Neptune's seasons has come around once sinceits position was predicted by French mathematician Urbain Le Verrier and British mathematician John Couch Adams, and the planet was subsequently discovered by German astronomer Johann Galle on September 23, 1846. With an orbital period of approximately 165 years, this week on July 12, Neptune has been once around the Sun since its discovery date.